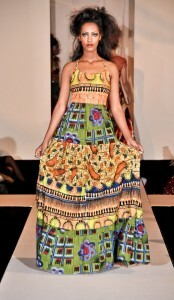 Joan Okorodudu is fast becoming a top African fashion designer as shown by the most recent display of her latest designs at the 12th International Couture Collections Show that is popularly known as the DC Fashion Week held at the La Maison Francaise (Embassy of France) in Washington, D.C.
Nigeria is blessed with highly gifted fashion designers like the celebrated Deola Sagoe, Frank Osodi, Dakova, Mudi, Zizi Cardow, Hallero, Estella Ogbonna, Bayo Adegbe of Modela Couture and others who can walk tall among the best in the world. The last time I saw the ever beautiful and charming Joan Okorodudu was at Linda Ikeji’s Style Night held at the Jade Palace on Adeola Odeku Street on Victoria Island, Lagos. She was full of smiles and dimples as she admired the awesome designs of Bayo Adegbe of Modela Couture and other creative designers. 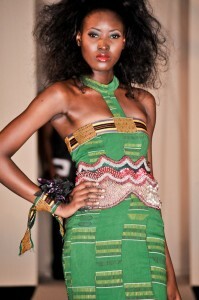 She has been doing her best to promote Nigerian haute couture locally and internationally. Joan Okorodudu was showcased with Corjor International, Andrew Nowell, Van Maela, Thinkking Hats, Cameron Gray, Kalaa and Destiny’s Creations & Designs, Saman Zar, Tatjana and other fashion designers who were from the US, Pakistan, Serbia, Nigeria and other countries. Joan Okorodudu was born on October 28, 1958. She hails from Aniocha North Local Government Area in Delta State, Nigeria. She graduated from the prestigious Boston University with a political science degree in 1981, and returned to Nigeria to fulfill her Youth Service commitment. During that same year, she was named first runner-up and later Miss Nigeria. This was also the year she became a fashion designer. 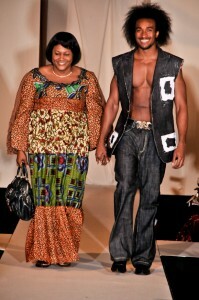 Okorodudu showcased her House of J’ola Clothing lines in many African nations’ fashion weeks. She is a well tested fashion designer and also the Chief Executive of House of J’ola Designs, which produces exotic designs for all ages and occasions. House of J’ola stocks original fabrics from Gucci and Roberto Cavalli, including silk and taffeta, French and original woodin. Her sojourn into fashion designing dates back to 1990 when she opened her first fashion house in Wilmington, Delaware, which she ran for three years before returning to Nigeria. Joan, or “Mama J” as she is fondly called by close friends and relatives, is a mother and wife of 26 years. ~ By Ekenyerengozi Michael Chima, February 25, 2010.